Edward Fitzgerald Burns also known as Ed Burns is an independent filmmaker, as well as an actor, director, producer and screenwriter. He received the coveted Grand Jury Prize at the Sundance Festival in 1995 for his film 'The Brothers McMullen' (1995), a comedy about the romantic escapades of three Irish Catholic brothers. Burns was born in Queens, New York and attended Oneonata College and The State University of New York in Albany. He transferred to Hunter Collage in Manhattan to study film, where he made shorts. In 1993, he worked as a production assistant for the TV show Entertainment Tonight, where he first had the idea for The Brothers McMullen (1995). He shot the film at his parents' house with a colossal budget of $25,000 and the donated talents of ET crewmembers. While the film was rejected by distributors, it was embraced at Sundance, winning the highest honor. Burns continued with the same cast and crew to make She's the One (1996) with Jennifer Aniston and Cameron Diaz. Tom Petty wrote the original soundtrack and this time, Burns' budget was a healthy $3 million. His third feature was Long Time, Nothing New, now called No Looking Back. In 1998, Edward Burns could be seen in Steven Spielberg's World War II drama Saving Private Ryan (1998). Since then he's been working on projects that are a little different. "I'm getting antsy to work with a bigger budget," he says. "At a certain point, you don't want to compromise the look of the film." Although he hasn't hit the big time as a director yet, since Saving Private Ryan, Burns has scored bigger roles in high budget films such as starring with Angelina Jolie in Life Or Something Like It (2002) and working alongside Ben Kingsley in A Sound of Thunder (2004). His personal life is going along smoothly as well, having married supermodel Christy Turlington on June 7, 2003. Edward and Christy's first child, a baby girl named Grace, was born in 2003, while their son, Finne, was born in 2006. 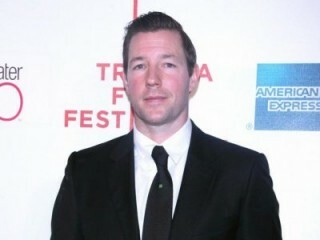 View the full website biography of Edward Burns.